Surprise your loved ones with a beautiful gift this Holiday Season – the gift of self care. This Holiday Bundle is the perfect way to show someone close that you care. Start your merrymaking on the right note when you purchase Chillax for the Holidays only available on the Thanksgiving weekend! 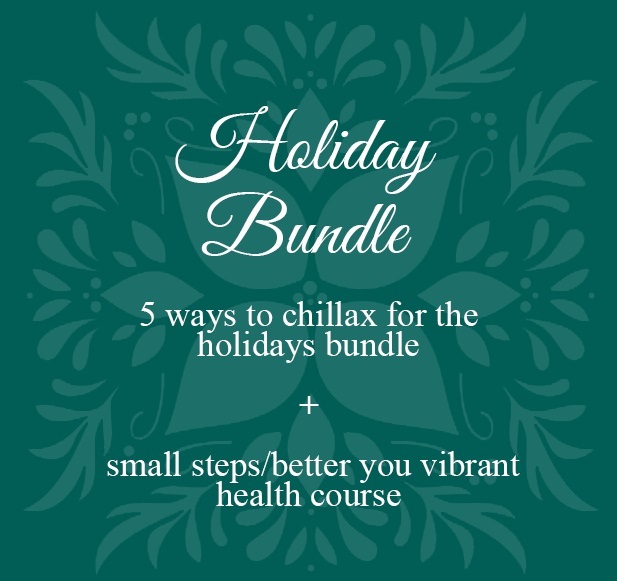 5 Ways to Chillax for the Holidays: makes a great gift! 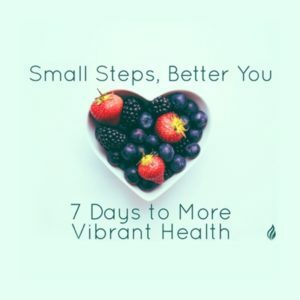 This 7 day course helps you navigate how to adjust your daily eating, exercise, and sleeping habits in smalls ways to jumpstart your path to wellness. You will receive an introduction to healthy habits that will transform your health and well being. It is a perfect way to jumpstart a healthier and happier New Year! You can read more about this course here. Jackie hosts a cooking video of her preparing a green smoothie in her kitchen. She explains how to how to blend it so the mouth-feel is just right. This video is part of the 10-week Body Evolves course but she is offering it to you as a holiday gift. Enjoy! A daily meditation practice is a great way to take care of the Holiday stress and beyond into the new year. Starting your day with meditation helps the rest of your day unfold in a more easeful way. Through daily regular meditation practice we learn to release our identification with our thoughts. Freedom from the prison of our thought process is the best holiday gift you can ever receive. Enjoy this 10 minute journey to the heart! Starting the day with a 15 minute gentle yoga practice will make a huge difference as you navigate the holiday season and beyond. This video is the gift that keeps on giving. It will help you focus your mind, warm your body and joints and open your heart for the day. Your body, heart, mind, coworkers, friends and family will all thank you. Enjoy this 10 minute practice to release tension and help awaken your feet and unwind after a busy day. Toe yoga is a great way to prepare for a good night’s sleep. By keeping your feet supple and flexible you will see improvement in your balance, a stronger connection to the earth, experience less stress and more groundedness in your life and nervous system. By regular practice of Toe Yoga, you will experience more confidence in your ability to walk safely on the earth. This Coupon entitles you to 50% discount on a one on one Yoga/Meditation session with Jackie Prete, Certified Anusara Yoga teacher and teacher trainer. 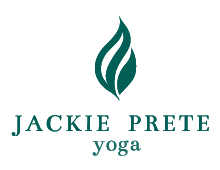 Jackie has over 25 years of experience helping folks start or fine tune their yoga and meditation practice. This session normally sells for $150 is available for $75 . The coupon expires January 15 so book the appointment as soon as possible. You can do this session in person in Jackie’s studio in Manhattan or online over Skype if you are out of town. Click here to schedule a session.